On a recent visit to the Blue Mountains, I saw that the cable car we rode in a decade ago had been retired and now on display like a museum piece. I also noticed that the gift shop and restaurants had been expanded and that we had to go through a long 'queuing' area to get to the ticket counter that it felt as if I was entering an amusement park. My first visit to the Blue Mountains was a decade ago on my first trip to Australia. I remember several things about that trip. My relatives from Australia and I seemed to be the only visitors there that day. We drove from Sydney and stopped at some park to grill slabs of meat and shrimp on the Barbie. We were surrounded by colorful birds: finches, sparrows, cockatoos. My little niece explained to me how the Blue Mountains got their name (from the blue haze that comes from the oil of the Eucalyptus trees covering the mountains). 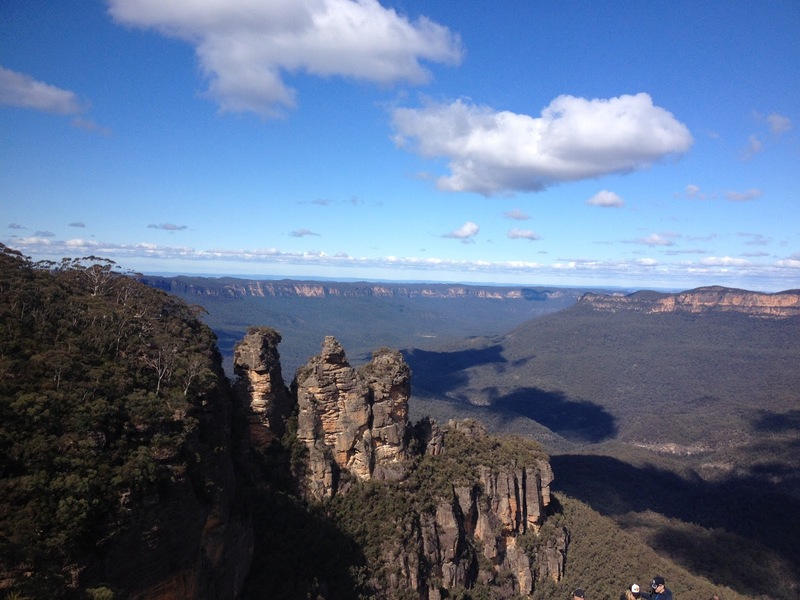 When we arrived at the park, we bought some tickets to ride the scenic skyway to the other side of the lookout and to see the most iconic view of the Blue Mountains: the Three Sisters, a rock formation representing three sisters who according to Aboriginal legend were turned to stone. But my most memorable experience was riding the world’s steepest incline railway to reach the Rainforest. We plummeted into darkness and into the bottom of the mountain and the Rainforest. (I do not remember exactly how many feet below, but it was the highest drop I have ever experienced). And that precarious drop was my introduction to the Rainforest and to ‘bushwalking’ (the Australian term for hiking, walking or trekking) and discovering my love of nature. I was excited to re-live the experience of riding the steepest railway to the bottom of the mountain and to bushwalk the rainforest again but disappointed to find the trail boarded. We could not go up close to hug the oldest trees like we did before. But I did see a few birds. I did the things that most visitors do of riding the scenic skyway cable car to see the waterfalls and the lookout for a nice view of the Three Sisters. However, I made it a goal to do more ‘bushwalking’ on this trip. The cable car car took us to the other side where a number of trails branch-out. I had no idea which one went where so I just went the opposite direction of the Wentworth Falls, where everybody was heading. The trail was at the edge of the mountain; it was scary that I thought a misstep would take me tumbling down the limestone cliff. But the view was incredibly beautiful. I was at the complete opposite of another mountain range. In between a wide-open space, overlooking a sea of green and eucalyptus trees and white birds flying over the green trees, I could see the towering orange/purplish and gray cliffs and the rocky pinnacles on the other side. I also saw remnant of burned trees still clinging to the cliff. As I stopped and gazed at the majestic sight, the whole place burst with energy. I realized that people have the same desire that brought me there. They come from different corners of the world to enjoy the incredible natural wonder. I then began to understand the need for structured tours and cable cars and railways and boarded trails to prevent us from kicking down thousands of plants and destroying the ecosystems.